The Baberoo has owned one of the CDs by Nick Cope, the Oxford-based children’s singer-songwriter, for quite a while now, and we have always enjoyed listening to his music. But we had never been to see one of his concerts (£3 per child, £1 per adult) until last month. We accompanied some friends who are regular attendees to a performance at the St Albans Church Hall in East Oxford (corner of Charles and Catherine Streets), and as soon as he started playing I kicked myself for not attending a live show before. There’s a reason Nick Cope has such a strong following. He is beloved by both children and parents because his songs are delightful and catchy. We’ve all had the irritating ‘Wheels on the Bus’ earworm follow us around for days at a time, but Nick Cope’s songs are so funny and tuneful that it’s actually a pleasure to catch yourself humming, oh, say, a song about a witch that lived in a forest with a pet dragon named Keith. It’s his unusual and inventive songwriting that’ll charm you first, and if you’ve got his CDs (he’s got three so far and a fourth to be released for Christmas 2014) then it’s fun to sing along to his indie-pop-sounding songs with your little one at home. But when you see him performing live, you’ll realize what you’ve been missing. It is brilliant live entertainment. He’s got an incredible talent for relating to both children and adults at the same time. He gets the audience clapping, stomping, making faces, and jumping up and down with gusto. His act is a perfect balance of over-the-top gurning and deadpan patter. And his impressions are spot-on; when he does one of his animal songs you actually believe that what you are seeing in front of you is a meerkat. Nick Cope plays weekly family music sessions at several locations in Oxford and Abingdon, and also performs at festivals and events in and around Oxfordshire. The session we have attended most frequently runs from 10:45-11:45 on Fridays at St Albans Church Hall in East Oxford (although it’s a bit of a trek for us; I wish there was a concert location in Headington!). We’ve also been to see him in Wantage at the Beacon, and he’s a regular at the Story Museum during school holidays. Check Nick’s site for details of locations and times for upcoming sessions. The following details about space, ambiance, facilities, and feeding (as per my usual ratings system) refer specifically to the St Albans Church Hall location. Space: The space at St Albans Church Hall isn’t huge, but it’s got enough room for about 30-40 families, including enough space for everyone’s baby carriage to be parked at the back. A half-circle of about 30 chairs provides a seating space, and there’s plenty more space to sit on the floor. Many children love to go right up to the front to watch Nick play, all the better to watch his hilarious facial expressions. Ambiance: The feeling when you walk into a Nick Cope concert couldn’t be more wonderful. The music puts you in such a good mood that you feel like you’re friends with everyone in the room. To watch the gyrating toddlers throwing themselves around in gleeful abandon takes you back to your own childhood, lifting your spirits and temporarily banishing all your worries. There’s a reason I’ve never seen a kid cry at a Nick Cope concert (unless they’ve fallen and bonked themselves, in which case the crying only lasts a couple of seconds). It’s like magic. Yes, it’s that good. Facilities: St Albans Church Hall, unfortunately, does not have any baby-changing facilities. However, there would be ample space on the floor (not in the bathroom itself, but in the concert area) if you needed to change a diaper. But I’m guessing most people who attend live close enough to be able to get home fairly quickly (perhaps while even humming Nick’s song ‘The Baby’s Done a Poo’) in the event of a diaper emergency. I can’t speak for the facilities at the other locations where Nick does concerts, but again, it may be that many attendees live close by and can get home for diaper changes. Feeding: I’ve seen mothers happily breastfeeding their younger babies as their toddler joins the ranks of dancing children. And although food is not available to buy, eating in the hall is permitted and there are plenty of rice cakes, raisins, and other snacks strewn on the floor by the time the concert is over. In total, the Nick Cope concerts at St Albans Church Hall get a 6 out of 8 on my baby- and toddler-friendliness scale, the mark lowered only because there is no baby-changing facility available at that location (not his fault, of course!). But Nick Cope himself gets a 10 out of 10 in my book. Go and see his concerts; you and your young children will love them. It says a lot about a restaurant if I visit it twice in one week. It says even more if it’s on the opposite end of town from where I live and I still make the effort to get there. That’s what I did this week with the Oxford Kitchen (215 Banbury Road, Summertown, OX2 7HQ). 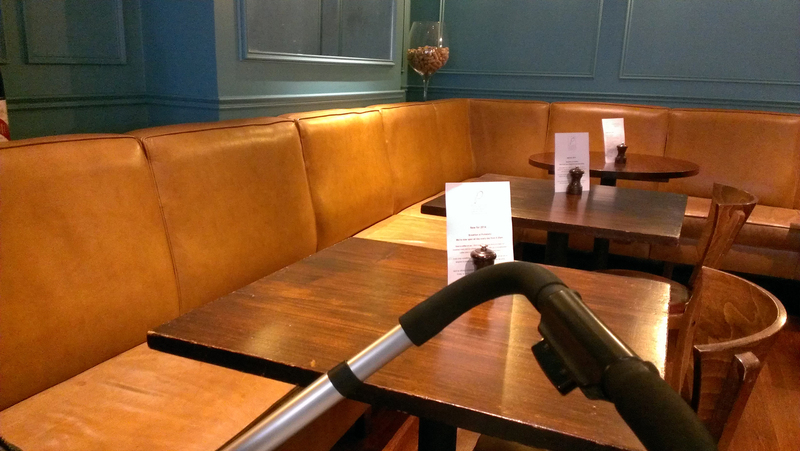 I had been wanting to visit this new restaurant since it opened a few months ago – the menu looked spectacular and the reviews were generally excellent, so I wanted to see whether it lived up to the hype as well as to establish how baby-friendly it was. 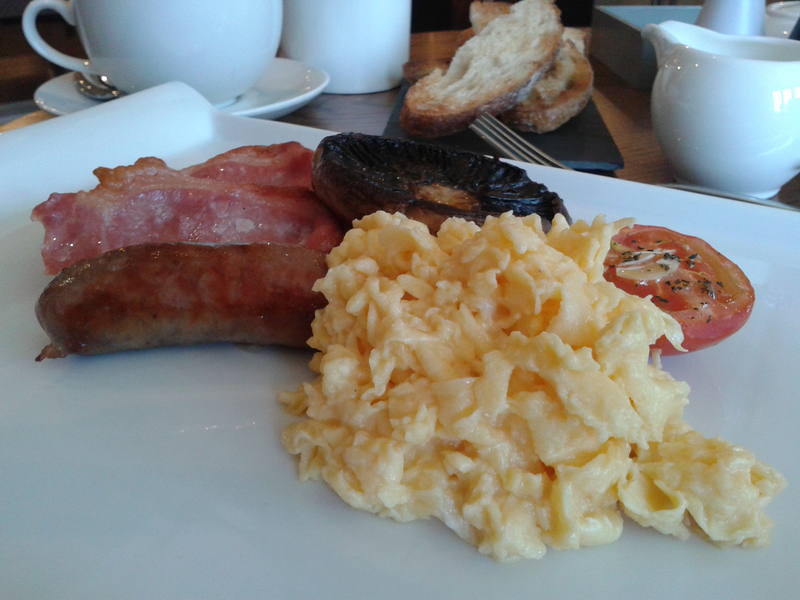 My first visit with the Baberoo was for Sunday brunch; I ordered the full English breakfast (£10.50) for us to share. While we waited, the Baberoo enjoyed playing with the coloured pencils she was offered, dropping them one by one on the floor. When the meal came, she devoured the scrambled eggs – I hardly got any at all! – and also had some of the toast, which was a bit too crispy for my liking. The sausage was lovely and had that gooey stickiness to it that only slow cooking will produce. The bacon was good, and the grilled tomato was elevated to something special with slivers of garlic. My Earl Grey tea (£2.50) and a pain au chocolat (£1.75) completed the meal; the pain au chocolat was very nice but – like all pastries – would have been better warm. I could have written this review after our brunch, but I had already studied the à la carte menu and knew there was a ham hock with my name on it. There was nothing to do but come back for it. I was sneaky and timed today’s lunch for when the Baberoo was sleeping so I wouldn’t have to share anything with her. Poor kid, she missed out. 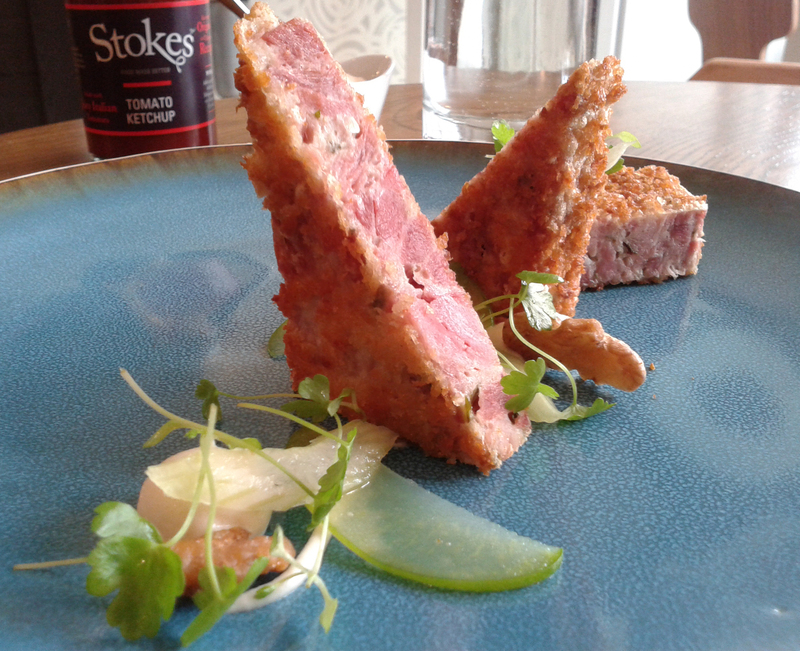 The crispy ham hock with celeriac purée, compressed apple, and walnut (£7) was delicious. The saltiness of the ham and the crispiness of the breadcrumb coating went perfectly with the tart green apple. The celeriac purée was smooth and velvety. Since the ham hock is a ‘small plate’ (you can have it as a starter or order several small plates to share), I also went for a beef burger (£12.95) as a main, because I seem to be on a burger kick these days. 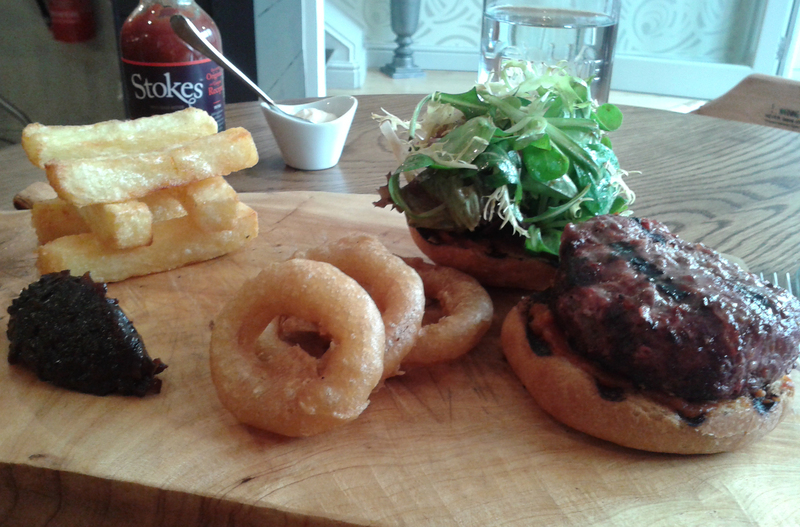 It came with a red onion jam, mixed leaves, and triple-cooked chips. Not advertised on the menu but also making an appearance on my plate (or, rather, my wooden board) were some onion rings. Folks, I haven’t been so excited to see fries and onion rings together since I was in high school and our beloved Canadian burger chain, Harvey’s, introduced Frings (fries and rings together so you got some of each). I am always thrilled to see onion rings, as you may know if you read my blog regularly. That said, these rings were somewhat disappointing as they had a bitter taste. It wasn’t the onions themselves, it was the batter. I’m not sure what happened there but I hope it was just a kitchen mistake. The chips were much better; you don’t get many of them but they are thick and fluffy and perfectly crisp. The burger was great; it had a certain amount of charring on the surface that might not appeal to everyone, but I enjoyed it. The mixed leaves were miles better than the usual iceberg lettuce and the red onion jam was sticky and delicious. It was a lovely meal and I thoroughly enjoyed myself. Despite not being able to even finish the burger because I was so full, I was toying with the idea of ordering dessert, but the Baberoo woke up so I left well enough alone. Although I do think I will have to go back sometime soon just to order dessert! 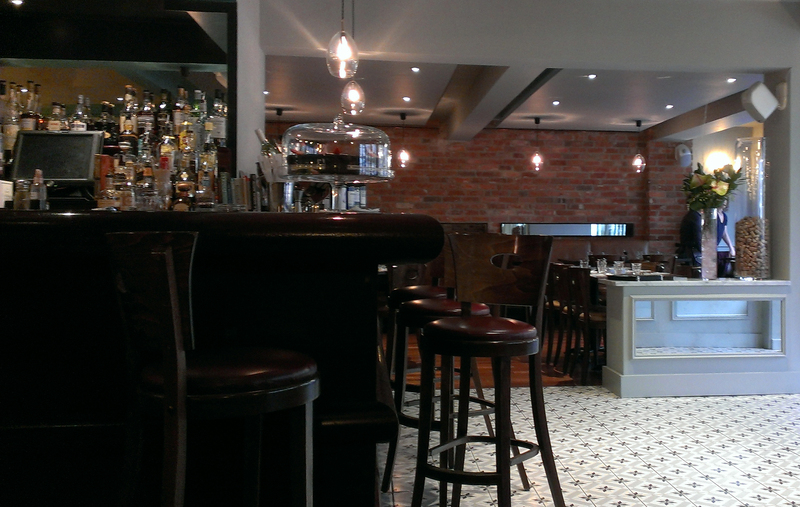 The Oxford Kitchen is certainly one of the best places I’ve dined in Oxford. So how does it do for baby-friendliness? My five-point scale covers menu, space, ambiance, facilities, and feeding (more about these on my About page). Menu: Many of the ‘small plates’ on the a la carte menu can be eaten with one hand if you need to hold a baby in the other arm, although many of the main plates will need both hands, so you may not have that much choice there. The set menu for lunch/early supper (£10.50 for one course, £13.50 for two, £16.50 for three) may be a better option; both starters and at least one of the main courses are one-handers. Space: There was lots of space for the Baberoo’s carriage at the table I chose near the front. There is less space as you go towards the back of the restaurant, although you can probably get a pram in at most of the tables. 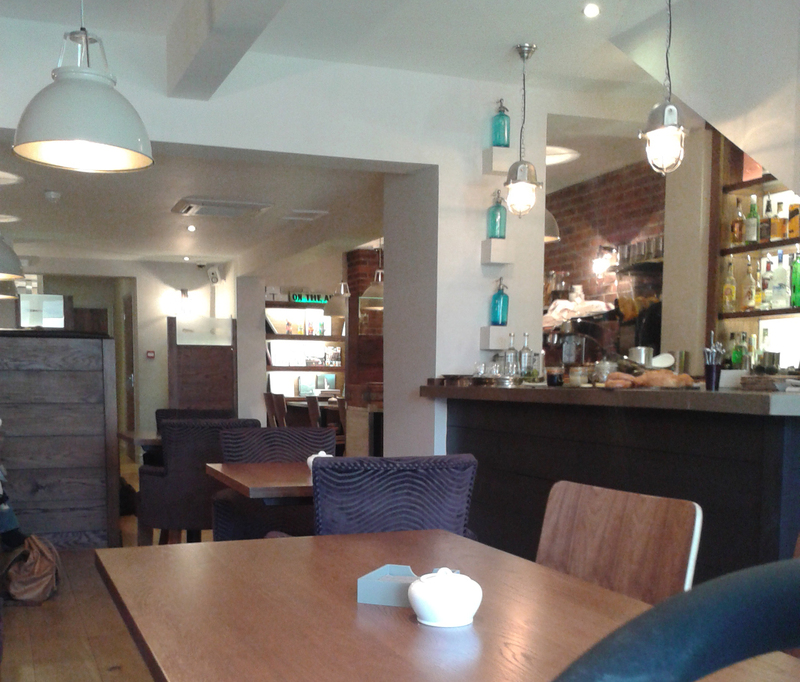 There is lots of seating upstairs but it’s not accessible with a pushchair. If the restaurant is full of diners it may be a squeeze to get through. The front door is somewhat heavy and it isn’t within easy view of the staff, so although they are happy to help you in and out, on one occasion a passer-by on the street had to help me get our pushchair in. 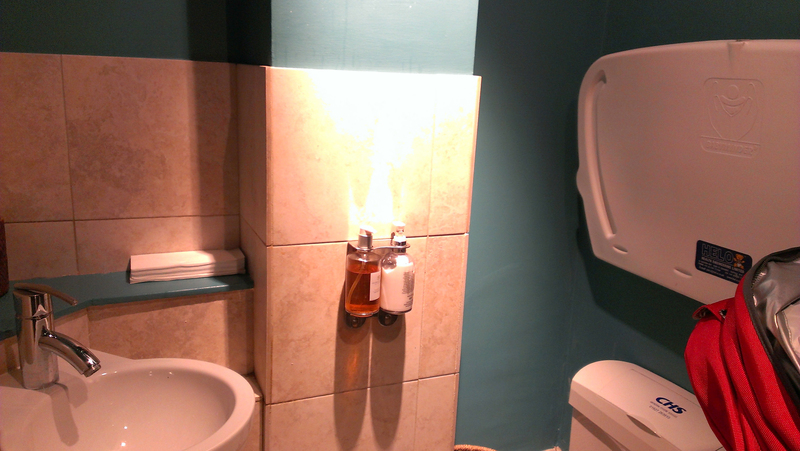 Ambiance: Couldn’t be nicer. The staff were fantastic. They asked right away about whether we needed a high chair, offered a colouring activity to help the Baberoo pass the time while waiting for brunch, and interacted with her whenever they came to our table. They also remembered us when I came in the second time. The restaurant is light and airy, with huge windows and a calm, relaxed vibe that is hard to come by in some fine dining places. Facilities: The baby-changing facility is part of the women’s/disabled toilet on the ground floor. 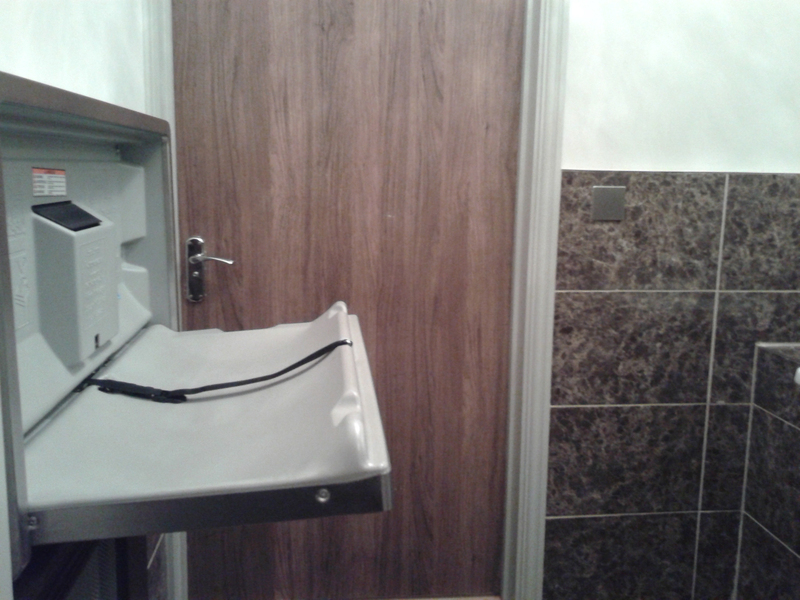 The pull-down table – one of the swanky metal ones – is in the entrance area to the room along with the sink, and there is a separate toilet cubicle. It’s all very clean and fresh-smelling. There is quite a lot of space in the baby-changing area, but if you need to bring your pushchair into the toilet cubicle with you it’s a tight squeeze. There should be a lock on the outer door, not only on the toilet cubicle door. Feeding: If you are a breastfeeding mother the wooden chairs will be fine, although the padded upholstered ones may not be great because they have arms that jut out quite far forward. For babies who are on solids, there is a children’s menu (£5 for one course, £7.50 for two) that has some kid-pleasing meals on it; most children’s palates probably won’t be refined enough to appreciate the regular menu. For baby-friendliness, the Oxford Kitchen scores a 7.5 out of 10. If you want fine dining, there are very few places in Oxford that can outdo this one. Go for lunch or brunch while it’s still a bit of a secret, because when it starts getting more popular it’s going to be jam-packed. A little while ago the Baberoo and I were on a shopping trip in Summertown. 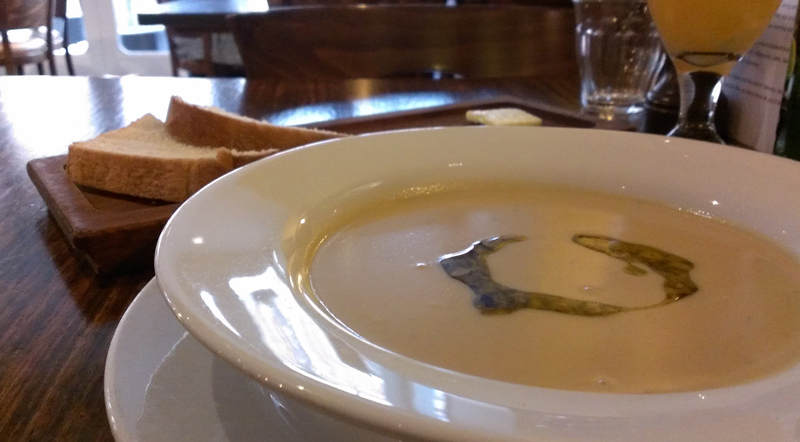 It was a cold, wet, horrible winter day and we needed a comforting hot meal, so we popped into Portabello (7 South Parade, OX2 7LJ), which has recently refurbished both its interior and its menus. I took advantage of the £9.95 two-course lunch special. As my starter I chose the cream of cauliflower soup with toasted walnuts. I’d never have thought of pairing cauliflower with walnuts, but they are a wonderful taste combination, and the soup had a perfect velvetiness that magically soothed away the irritations of the drab and drizzly day. The Baberoo ate the bread that came with it, which was perfectly fine but not of the artisan quality that I might have expected to go with the soup. My main was the osso buco with fried polenta. 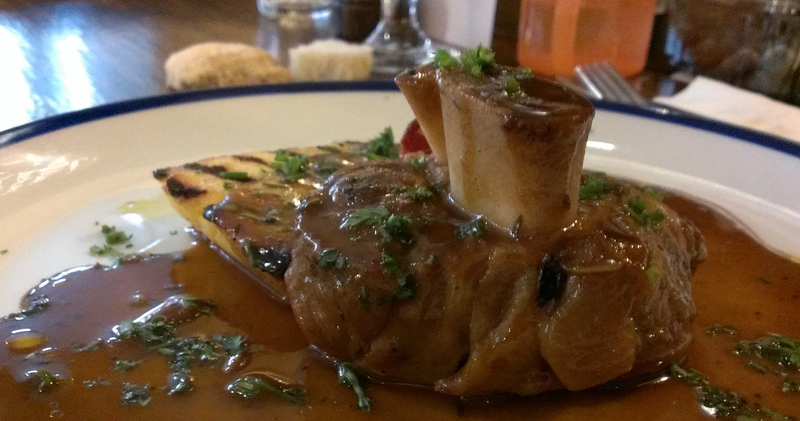 The osso buco was very nicely done and mostly falling off the bone – the Baberoo ate quite a lot of it. The fried polenta was too salty and didn’t add anything to the dish; it would have been better with a creamy, soft polenta that stayed in the background to let the osso buco shine through. Midway through the meal the Baberoo decided to have one of her most ear-deafening tantrums yet, for no apparent reason. There weren’t too many diners in the restaurant yet, but this meltdown was the kind that would soon irritate anyone within earshot. I had to gobble the rest of my lunch and get us both bundled up and out of the restaurant, quick. Back in the rain again, I regretted not being able to linger over my lunch in the calm and quiet atmosphere of Portabello’s dining room. So, how did Portabello measure up to my five criteria for baby-friendliness? They are menu, space, ambiance, facilities, and feeding (more about them on my About page). Menu: If you need to hold your baby with one arm while eating one-handed, the regular lunch menu has several items that will allow you to do so. The regular lunch menu is somewhat more expensive than the lunch special, with starters running from £6 to £9 and mains running from £12 to £16. If you’re going for the special £9.95 lunch menu, note that it changes often so your ease of eating one-handed will depend on what is available that day. Space: The entrance to Portabello is a vast space, but the amount of room around the tables varies and tends to be somewhat small, especially around the bench-seating area. We used a table for four and squeezed the baby carriage into one of the seat spaces. It’s doable in some areas of the restaurant, and the way the space is laid out means that you don’t have to travel very far to get to any table so you won’t need to weave your way through the restaurant with your stroller. However, it’s not so good for groups because you wouldn’t be able to get more than one stroller at a table. Ambiance: Calm and quiet, with a mixture of sophisticated and homely decor. The staff were very friendly and helpful with the baby carriage and high chair, as well as with directions to the baby-changing facilities. The Baberoo (before her tantrum) enjoyed turning around in her high chair to catch the eye of the bartender and practice her waving, and he was a very good sport and gave her a lot of attention. Facilities: The baby-changing facilities are in a smallish space, although we managed to squeeze our huge pushchair into the room anyway. The room is pretty and clean and smells amazing for a baby-changing room! The changing table is a good size. Because of the layout of the hallway, it may be hard to manoeuvre your pushchair into the room, but we had some help from our server, who was very kind and held the door open for us. Feeding: The Baberoo ate part of what I brought from home for her and part of my lunch. She would have also enjoyed most of the kids’ menu, which offers a main plus a dessert for £7.50 (Sunday roast is a £1.50 supplement). I didn’t breastfeed while we were there and the chairs are on the small side, but the benches looked quite comfortable (though there isn’t much space around them). For baby-friendliness Portabello scores a 7.0 out of 10. It might be a tight squeeze if there are lots of diners, but at less busy times it’s a lovely place to relax and linger over your meal – if your baby lets you. Last week the Baberoo and I met up with my NCT friends and their babies at Barefoot Books (294 Banbury Road, OX2 7ED) for some tea and cake at the Storyteller’s Café. The bookshop’s ethos is global culture and diversity, and its independent publishing imprint reflects the founders’ love of storytelling. 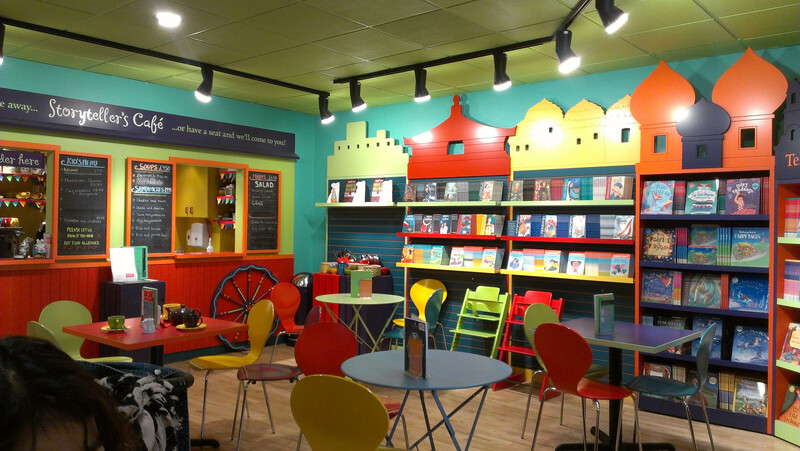 The café is a place where many parents come to chill out while the kids run around the bookshop singing along to animated videos on the big screen and playing in the storytelling area. It’s pretty much a children’s paradise. On this visit, I ordered a chocolate brownie and pineapple juice (£5 all in). The Baberoo ate some cooked apple and toast brought from home. 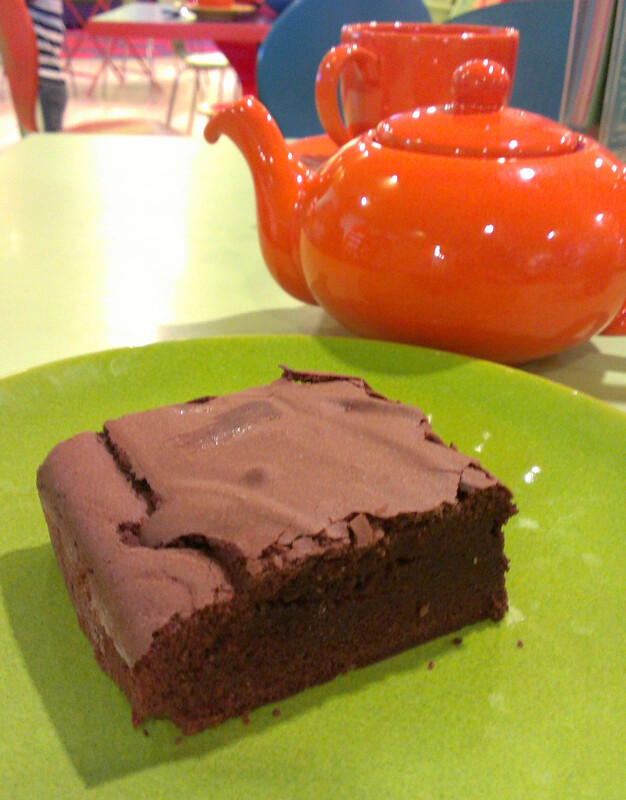 My brownie had a chilli kick to it, which was nice, although its cakey nature meant it was slightly on the dry side. The chocolate sauce that would have come with it might have mitigated this, but they had run out before I got there. So how does Barefoot Books rate for baby-friendliness? My rating system, which is explained fully on my About page, covers menu, space, ambiance, facilities, and feeding. Here’s how Barefoot Books stacked up against my five criteria. Menu: The Storyteller’s Café menu includes sandwiches, quiches, salads, soups, and other lunch dishes, as well as all-day breakfast, cakes, and other treats. There’s also a kids’ lunch pack with kid-friendly items, although I think probably most of the menu items would be enjoyed by children. You’ll be able to find several items that you can eat with one hand while holding a baby. There are also lots of high chairs (the most I’ve ever seen in one establishment – and they are the lovely Stokke Tripp Trapp ones) that you can use for your baby if you want to be hands-free. Space: On most of the occasions I’ve been here, the place has been jam-packed with parents and children. You won’t have any trouble manoeuvring through the bookshop, but once you get to the café you may find yourself trying to squeeze through rather tight spaces. Since it’s such a family-friendly place there are usually lots of baby carriages everywhere, but if you’re stuck people will move their carriages out of the way for you. Our NCT group chose to meet during the school run hour, which meant that we enjoyed more space to ourselves since there were fewer families there. Bonus! Ambiance: Colourful, fun, and geared towards children. 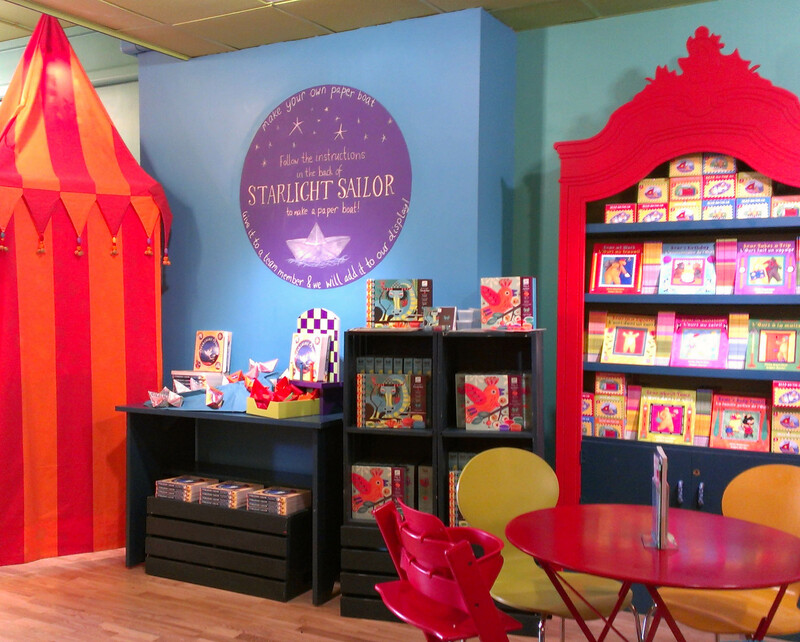 Activities abound in the bookstore, including storytime, arts and crafts activities, and the animated video wall that kids can sing along to. There’s also an events calendar with bookable events such as pilates (for parents), ballet, tap, and yoga (for children), and sessions in French, Spanish, and German, many of which take place in the upstairs studio. The staff are friendly and obviously very welcoming towards children. It’s all so bright and interactive that you may find it grating after a while – or perhaps I’m the only parent who’s allergic to too much colour all in one place – but the kids will love it. I think as far as babies are concerned, the child-friendly stuff isn’t as attractive to them now as it will be in a year or two. Facilities: The baby-changing facilities are just as colourful as the rest of the store, which makes a change from the usual dull gray or cream fittings. There’s enough space to get your carriage in comfortably, and there’s a toilet for parents to use. 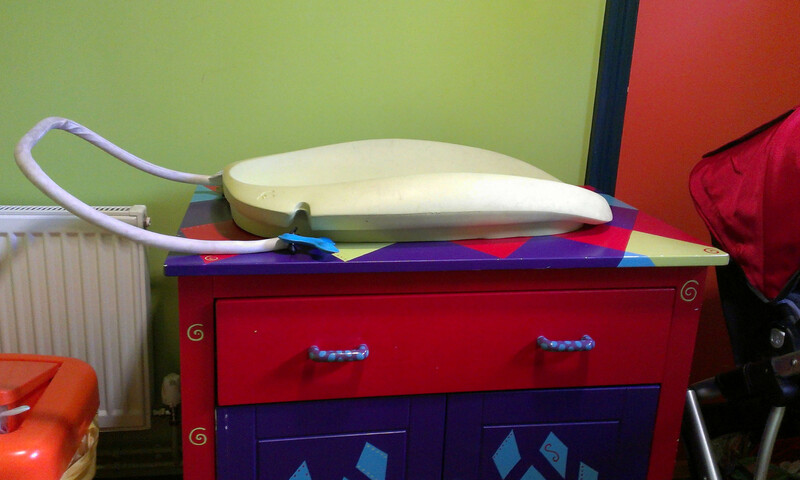 The room has an unusual, highly-curved changing table, which works well to prevent exploratory rolling. There’s natural light from a window and the room smells fresh, although the bin needs to be emptied more frequently; on this visit it was overflowing. Feeding: I’ve breastfed the Baberoo here on a few occasions and have felt right at home doing so, although the chairs aren’t terribly comfortable. There are comfier benches in the storytelling area, although you may not get to use them if there’s an activity going on. This is the kind of place where you might see several other mothers breastfeeding at the same time as you, so it’s very welcoming. I’ve also fed the Baberoo with snacks from home without feeling guilty for not buying her food from their cafe, although when she’s old enough and hungry enough to eat from a kids’ menu she’ll have some excellent choices here. Barefoot Books gets an 8.0 out of 10 for baby-friendliness, but I would still say it’s more geared towards children rather than babies. However, if you, like me, are encouraging your child’s love of books early, you’ll have a nice time perusing their bookshelves and finding stories to read to your little one. The Baberoo and I went out for lunch today with her Gran and Great-Gran at the Summertown branch of Mamma Mia Pizzeria (8 South Parade, OX2 7JL; there’s also a branch in Jericho at 102 Walton Street, OX2 6EB). Family friends have been coming here for over 20 years and I’d heard the pizzas were among the best in Oxford. 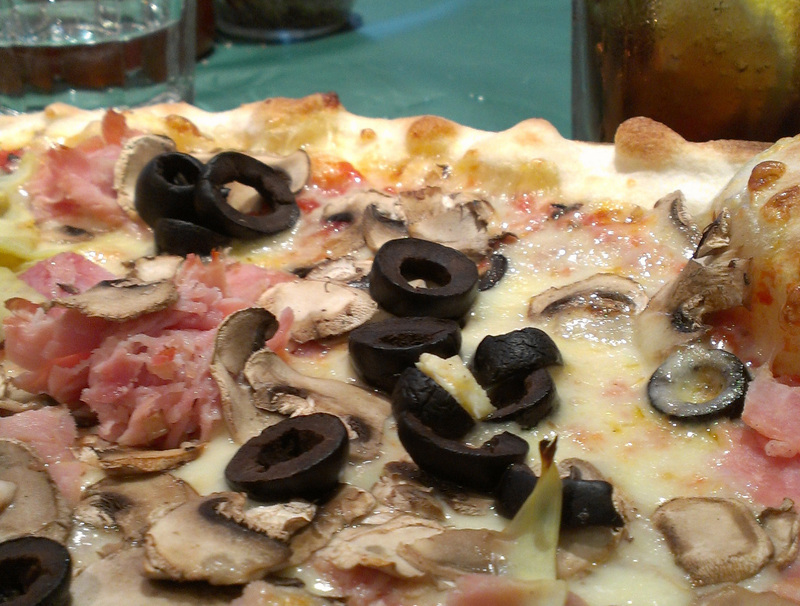 Pizza is so easy to get wrong that it’s lovely when someone gets it right. But how does Mamma Mia stack up against my five criteria for baby-friendliness? For my reviews I look at menu, space, ambiance, facilities, and feeding. Find out more about my ratings system on my About page. Menu: Pizza and pasta aren’t the easiest things to eat one-handed while you’re holding a baby, but if you get someone else to slice your pizza for you it’s not that difficult. The pizza at Mamma Mia has a very thin crust, but the top is not soupy like some thin-crust pizzas so it still holds up if you want to eat it with one hand using a libretto fold, pinching the sides in to contain the toppings. Some of the pastas would be fine to eat while holding a baby in one arm too. Space: There’s not a huge amount of space between tables, but we managed to get one where I could put the carriage out of the way so I wasn’t obstructing the way for patrons or staff. I did rearrange it a few times because I felt it was perhaps taking up too much space, and if the restaurant had been full I would have had a hard time. Still, the tables are not as close together as in some other places, and in the summer there’s outdoor seating in front which also looks like it has ample room for a baby carriage or two. 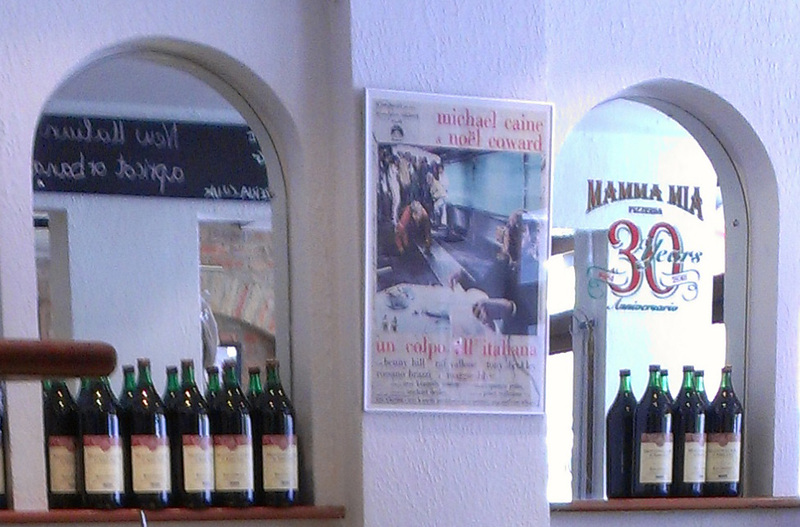 I wouldn’t come with my NCT group, however, as the restaurant wouldn’t have room for so many carriages all at once. Ambiance: This is a very family-friendly restaurant; many of the patrons were there with children and there were high chairs available for smaller tots. The staff are all very friendly towards babies as well, and talked to the Baberoo a few times (unfortunately, they didn’t get much of a response from her!). 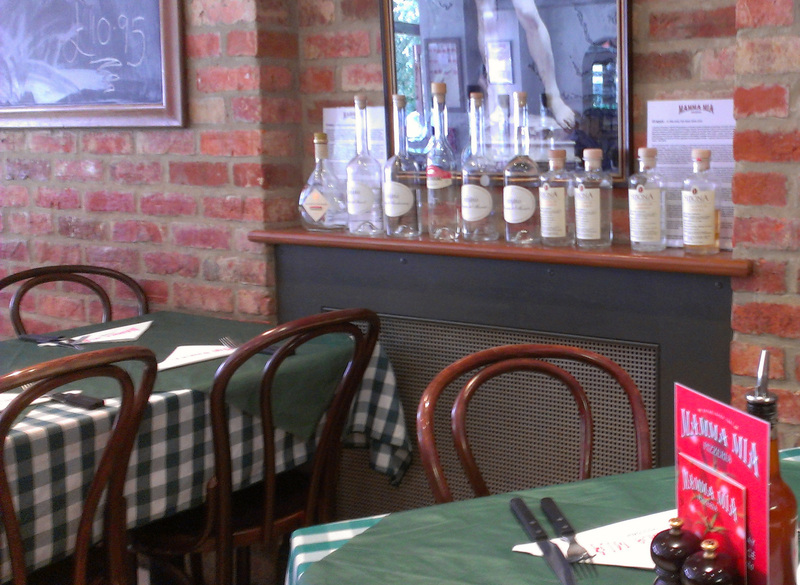 The exposed brick walls, checkered tablecloths and wine bottle displays give the place a homey, welcoming atmosphere. Facilities: To my surprise there was no baby-changing facility, which is a shame since Mamma Mia is such a family-friendly place otherwise. If you live in the Summertown area then you’ll be fine if you can get home again quickly should the need arise, but if you’re visiting the area just for the pizza then you’ll have to have a backup plan for baby-changing. Feeding: The chairs at Mamma Mia are the cafe-style wooden ones that don’t offer too much support; I decided not to try to feed the Baberoo because neither of us would have been very comfortable. If you can perch on a small chair to feed and your baby isn’t the fussy kind then you’ll be OK.
My final score for Mamma Mia is a 6.5 out of 10; it gets a lower score because of the lack of baby-changing facilities, but the pizzas are well worth going for.